Located in southwest Lancaster County, Pennsylvania, the Penn Manor Area (the Penn Manor School District) consists of the Conestoga township, Manor township, Martic township, Pequea township and Millersville Borough. The Conestoga Area Historical Society is dedicated to preserving the history of the Penn Manor Area. We are located in Ehrlich Park at 51 Kendig Rd. in Conestoga, PA 17516. 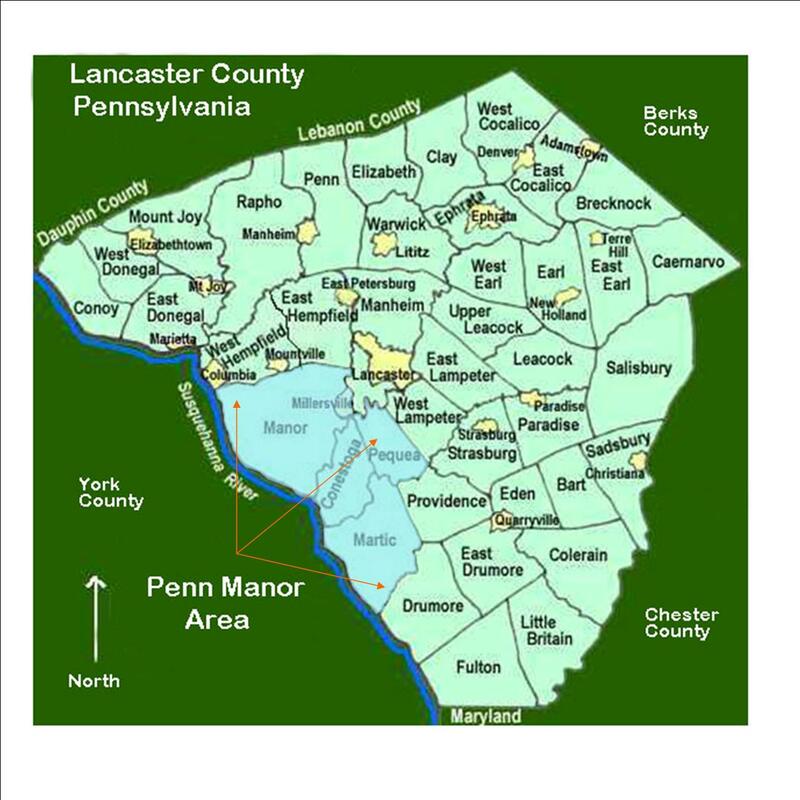 View a map outlining the Penn Manor area. For a map showing how to get to our museum, see Google Maps. The CAHS was founded in 1990 in response to a suggestion from the Lancaster County Historical Society. Several years before this, the County Society decided to change its mission to being a research and library facility. This meant it would not continue to be the repository of artifacts. It was suggested that regional local societies whose spheres of interest corresponded to the county’s school districts be formed. We were the last to organize. Dr. Mary Alice Smith recognized this need; she invited interested area residents to assess the interest for implementing one. Soon after the plans were prioritized, public meetings were held; committees to activate these were formed. We instantly received offers of objects of local history to begin a collection; however, there was no physical facility to serve as the Society’s center. After much exploratory work, the proposed gift of a circa mid-1800s tobacco shed was accepted. Now where to put it? Again many sites were checked out; the Conestoga Township Supervisors offered an incline area that had non-adaptability for athletics in Alex Ehrlich Park in Conestoga. This location was accepted by the Society in 1993. Three years later the impossible dream became a reality. Through the generous, unselfish efforts of countless area private and public corporations and individuals we were able to open the Museum building on November 17th, 1996. We now have 7 major buildings making up our museum grounds. For a listing and description of our buildings, visit Society Property. The buildings consist of the Tobacco Shed, the Steven Atkinson log cabin, the Michael Harnish Stone House, the Elmer Hoak Broom Shop (a toll booth), The Myers Tannery Shed, a replica of a Sweitzer Bank Barn, and the Tobias Stehman Blacksmith Shop. We hold our meetings in Gundel Hall, which is in the 1st floor of the main building. This Hall is available for use (for a donation). Contact us if you have a reason to use Gundel Hall for your gathering. The Conestoga Area Historical Society is a non-profit, volunteer-based organization dedicated to the preservation of the Penn Manor Area history by the exchange of ideas and information, the preservation of resources, and the presentation of historical artifacts from the area through it’s museum and buildings. Governed by a 15-member board, the Society provides a forum and a vehicle to achieve these goals. CAHS is a membership organization with 330+ members. If you would like to join us, visit our Membership page.